The view is harsh: a nearly naked man – his flesh raw – set against a stark background and ringed by three strangely dressed companions, each with a distinctive posture. One kneels before him – in mockery, in homage, or threatening to pierce, with reed or arrow, that pasty skin? Another is older, shirtless but helmeted. He bows slightly as he stares fixedly at the painting’s subject. The last stands proudly erect, grasping a purple cloak. Is he covering the red-bearded man protectively or continuing, contemptuously, to strip him? The fixed gaze of this last man is unnerving, implicating us in this scene. The maker of this large painting may surprise you. Its origins are even more surprising. Édouard Manet (1832-1883), often considered the father of Impressionism, but indisputably a bridge between Realism and Impressionism, made it. The subject is Jesus on the day of his death. Manet completed only two pictures inspired by biblical narrative, each in the mid-1860s. Despite the limited attention which this work receives today, it is a masterpiece, and was conceived as the complement to perhaps his best-known work, Olympia (1863). The pair of paintings was Manet’s sole entry to the Paris Salon of 1865: one picture sacred, the other profane. Édouard Manet: Olympia (1863), Musee d’Orsay, Paris. In each case the central figure is presented to us enthroned. Manet pays particular attention to the materiality of fabric, fur and skin. The two paintings make a remarkable contrast of colors and technique. In Olympia Manet sets the scene theatrically in front of curtains and wallpaper of the era’s fashionable browns and dark greens, and creates a luscious harmony in the cream, white and rose bed sheets, the artful bouquet and stylish slippers. Both of the figures there (a deferential black woman and an imposing white woman) are carefully modeled, their skin delicately displayed. But in Jesus Mocked, Manet applies the paint with an angry crudeness, in sections using thick impasto. His palette is darker and more restricted. Touches of warmer colors broaden the palette: in Jesus’s beard, in the orange turban on the man staring at us, and in the sunburned face and hands of the kneeling man. These create not harmony, but a sense of gritty authenticity. The feet of Jesus are bare and rough, scandalous in their particularity and presence as they protrude into our space. While Olympia inhabits a placid horizontality, this is a vertical composition with a primary diagonal line running from upper right to lower left, and a jarring contrast of two other diagonals: the arrow/reed and the spear. and brush with brown wash over graphite on paper). 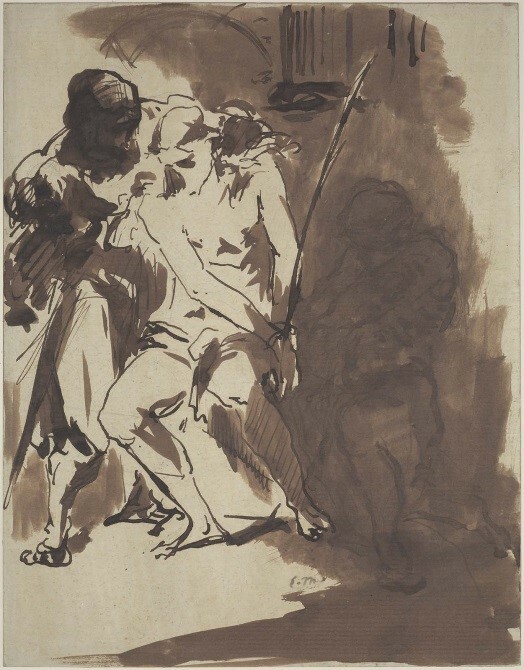 Manet’s preparatory drawing shows his purposeful trajectory from an original composition without the outward-gazing figure. By including him and using multiple diagonals across an utterly dark background, Manet draws us in as fellow participants with the soldiers, whose ambivalence suggests their knowledge of the wrongness of the torment they will inflict. While Manet made Jesus Mocked not for a chapel, but for a Salon, he creates a similarly active tension between the viewer and the image. This is a scene in which no one can be neutral. Like Olympia this picture is an image of love. But what love is this? A love expressed in vulnerability and suffering. Jesus’s humanity is palpable and raw, like his wounds – not seen at first glance – which the crown of thorns is pricking on his head. His bony knees, reddened ankles and sunken chest are not beautiful; they recall Isaiah 53:2b: “He has no stately form or majesty that we should look upon Him, nor appearance that we should be attracted to Him.” And yet Manet, with his striking composition set in this bright, unkind light, insists that we do indeed look upon him. Artists have long portrayed monarchs receiving homages offered by their vassals; Olympia is in that tradition. Manet’s Jesus is enthroned, with a gift in conveyance, but here the gift is made not by vassals but by the monarch himself: both king and interceder. Jesus’ sacrifice of himself is made in utter humility, and love for us as he looks to his unseen father. In this stasis, he inhabits both the forever and, with pain, the now. The rope in the corner – which will bind him to the cross – leads us into the narrative and out of this frozen moment. We join these soldiers in wonder, in contemplation and in gratitude, as taunting turns to awe. 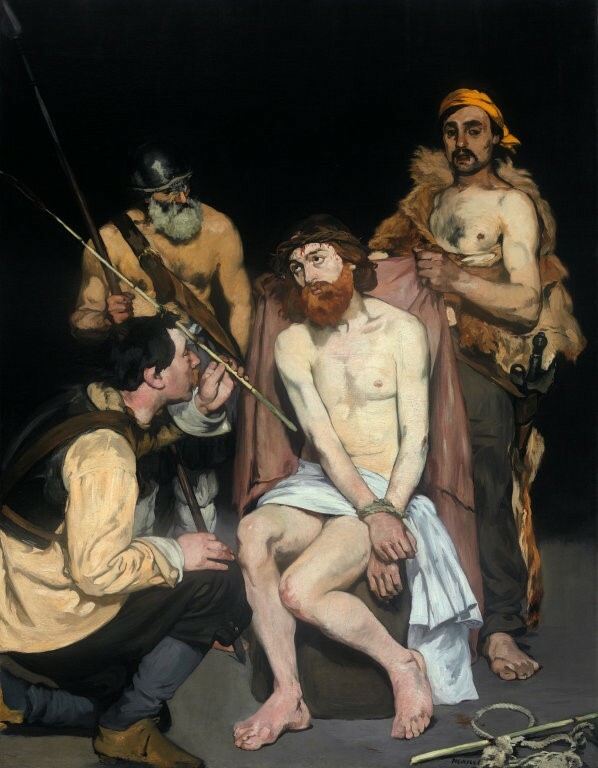 Édouard Manet: Jesus Mocked by the Soldiers, 1865, oil on canvas, 190.8 x 148.3 cm. Art Institute of Chicago, USA. Édouard Manet (1832–1883) is best known for his pictures inspired by contemporary life which capture brilliantly the evanescent effects of light and color. However, unlike his friends Claude Monet (1840-1926) and Edgar Degas (1834-1917), Manet never exhibited in the Impressionist exhibitions and continued to submit to the official Salons instead. Born in Paris as the son of a prominent civil servant, Manet studied for six years with the academic painter Thomas Couture (1815-1879). Manet was a deeply respectful observer of Renaissance and Baroque art, and knew well the masterpieces installed at the Louvre; he also made several trips to Italy, the Netherlands and Germany and later, Spain. He had particular admiration for the work of Titian (1490-1576) who was believed to have presented a similar pair of paintings to the Holy Roman Emperor Charles V of Spain (a Venus and Christ Crowned with Thorns). He created his only other major biblical work in 1864 (Dead Christ with Angels, now at the Metropolitan Museum in New York). The pair of Olympia and Jesus Mocked by the Soldiers evoked outrage among critics and the public at the 1865 Salon. The former work was scorned as a half-pornographic depiction of a prostitute, and Jesus Mocked itself was mocked as insufficiently devotional. The Salon needed to hire guards to protect the works against vandalism.